tayla is using Smore newsletters to spread the word online. "I dream of an africa which is in peace with itself"
Nelson Rolihlahla Mandela was born on 18 July 1918 in the small village of Mvezo, on the Mbashe River, district of Umtata in Transkei, South Africa. His Father named him Rolihlahla, which means "pulling the branch of the tree" or in a more common form "troublemaker." The name Nelson was not given until his first day at school. He was then sent to boarding school and later to Fort Hare Missionary College, he was then expelled from college for helping to organize a strike against white colonial rule of the institution. In his spare time he liked to study to become a lawyer to protect blacks. 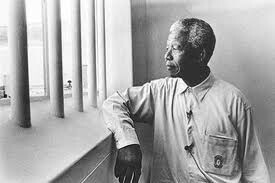 Nelson spent 28years in prison. Nelson Mandela was the forerunner for civil right and equilaity for blacks. The Act Ot Union denied all blacks voting rights. Black workers were not allowed to strike for it was deemed to be illegal. White made up a small population and owned most of the land. 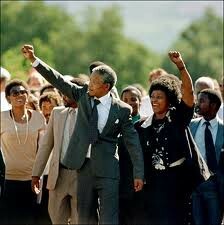 Mandela fought against National party as he took part of the African National Congress' Defiance Campaign in 1952. Nelosn Mandelas actions were driven by an unshakeable belief of the equality of all people and his determination to overthrow the racist system of the government. Nelson Mandela helped and organised many peaceful campaigns, but after many voilet disruptions by the state it becam clear to him and his colleagues that the state would not allow a peaceful change. In 1961 they formed an army for freedom fighters and launched and armed struggle. Nelson Mandela Fought for human rights beacuse he wanted blacks to be treated equally and he wanted the rascist laws from the government to be gone. February 1952 the ANC calls on all the government to repeal all unjust laws or face 'Campaign for the Defiance of Unjust Laws' Mandela is in charge of volunteers for the campaign. He travels the country organizing resistance to discriminatory legislation. The defiance campaign has helped build the ANC membership from about 7,000 at the beginning of the year to 100,000 by the year's end. 1955 The ANC write a 'Freedom Character' stating that South Africa belongs to the people living with in it not one certain race, that all South Africans should be treated equally before the law, and that the country's wealth should be distrubuted equitably. 1961 on May the 31st after gaining approval in a referendum restricted to whites, the government declares South Africa a republic. Mandela orders a national strike in protest. Nelson did peaceful protests and the government responded in a violent way. the noble peace prize is held here. 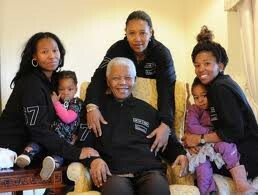 My opinion is that Nelson Mandela that he is a very wise man and he show us how rascism is a very harmful crime. He also shows us that you should always stand up for what you believe in and that all humans should be treated the same no matter where they come from or the colour of their skin.